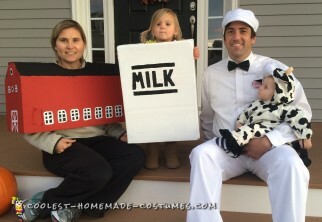 I first thought of being a milkman at the high school at which I teach. We have smaller advisories and I had the idea of having my students be milk cartons (one chocolate, of course!) for a group competition. I then thought it would be a good idea for my family and thought of a role of each of us. My wife being the barn/milking parlor was a perfect fit! It was hard convincing my daughter it would be cooler to be a milk carton than being Elsa but I it worked. The barn took the most amount of time to paint with the detail of the windows and doors and walking around in a barn while tending to kids will be a bit of a challenge but I think we will manage.